Submitted by ciordia9 on Wed, 2005-10-19 18:45. I was reading through my new Levenger catalogue and ran across the above. A notecard bleacher stand. Sounds like a fantastic idea. Has anyone found this idea for cheaper than 54$? I don't need a real wood one, faux, plastic, paperclipped will do. ;-) Have one of these at work and home with those contextual cards ready and waiting for me sounds like a benificial plan. Submitted by Vkaryl on Thu, 2005-10-20 02:24.
just about, and Levenger is the only place I've ever seen one of these in ANY material. Unless you have a handy husband handy (like I do!) I advise you just buy this one - it will cost you more to "approximate" it in the long run. If you'll use it, it's worth the price. Submitted by Deb (not verified) on Thu, 2005-10-20 05:47. Submitted by ciordia9 on Thu, 2005-10-20 12:38. Thanks for the commentary gang. I think I'll pick one up to trial out and maybe get work to pick up the other one. Besides one for my own home "command post" as Deb put it, my wife and I have been talking about yet another one for chores/household projects. Put all the cards of the next week on it and use the holder section as the next week rotation. Then it's not who does it, but what is left to be done. Certainly trying new things. I am really digging the analog quickness. Submitted by Ryan (not verified) on Thu, 2005-10-20 13:17. 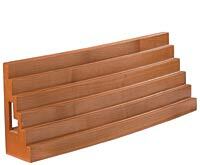 I've hummed and hawed over many things in the Levenger catalogue, including this bleacher. I saw a pic somewhere, possibly on flickr, of someone using a scrabble tile holder with their index cards, and I immediately thought of the bleacher. With a little creativity, you could probably cobble together a multi-tiered scrabble bleacher, though it obviously wouldn't be as fancy-pants as anything you'd get from Levenger. Oops! But you've probably already seen that pic! I just searched the hpda tag on filckr and found the pic at the bottom of the second page... and your hpda pics at the top of the first! Submitted by DigitalAlan (not verified) on Fri, 2005-10-21 02:14. I too have seen these in Levenger and was thinking about buying one - But I remembered that IKEA had a photo holder that allowed you to just stick the photo into a wooden base. I think I might head out to Levenger and pick a few of these up to make my own bleacher. If memory serves me correctly I believe the holder was only a couple of dollars. I will take some photos as I work on this and upload them to share. Leting everyone know how it turns out. Do you have a table saw? Submitted by SusanBeth on Fri, 2005-10-21 03:59. If so, it would be dead simple to make one of your own, to whatever dimensions suit you. Set the blade back to perpendicular, and cut a series of single blade-width grooves 1/4" deep down the length of the sloping 'top' of your bleacher. Space them to suit yourself -- four rows with about .75" between each might work well. Ta da! You now have a bleacher that will display up to a dozen cards for you. Finish as desired. At least sand any rough edges to spare yourself from splinters. Stain or paint or varnish or shellac. If I were making this for my own use, I'd hot glue a panel of felt onto the bottom to insure against scratching furniture surfaces. Submitted by Deb on Sat, 2005-10-22 20:06. I'd love to hear how your IKEA experiment works out -- like the original poster, I keep thinking of more places and ways to use one, but don't want to fork over that kind of money for duplicates! Submitted by ciordia9 on Thu, 2005-10-27 19:15. All I can say is wow.. this thing is nice. It's so nice I think I just might fork over some more money for a few more.. It's not just a rectangle, it's got a slight curve to it. This thing is beautiful. I can say that I wouldn't be able to make this at home to this degree of finish. Now to figure out the best optimized display of projects.. anyone have a GTD w/ Bleachers in Context howto? heheheh! Submitted by DigitalAlan on Mon, 2005-10-31 16:20. Well - The IKEA no longer has that item in stock - That was last years Item. So i found a similar Item on line. Any thoughts??? I am thinking this might work out just as well. ka-ching! Can you say Satellite Bleacher? Submitted by ciordia9 on Mon, 2005-10-31 20:55. DA that looks great. I'll score me a few in the morning guarantee! I don't think this replaces the Levenger product as it is very nice to look at and was built to be a tiered solution. However, those little holders would be perfect in different locations of my house. One in the kitchen, living room, hell maybe even the bathroom. Submitted by ciordia9 on Tue, 2005-11-01 14:17. The curved one you found is 13", this one looks like it may be more like 10-12" trying to think of the cards laying down. It's a little cheaper too. Since all my cards I make are horizontal instead of vertical this might get me a bit more gas. I'll order a few and report back. Submitted by drifting on Tue, 2005-11-01 14:45. This one from the first site is raised - not as stylish, though.